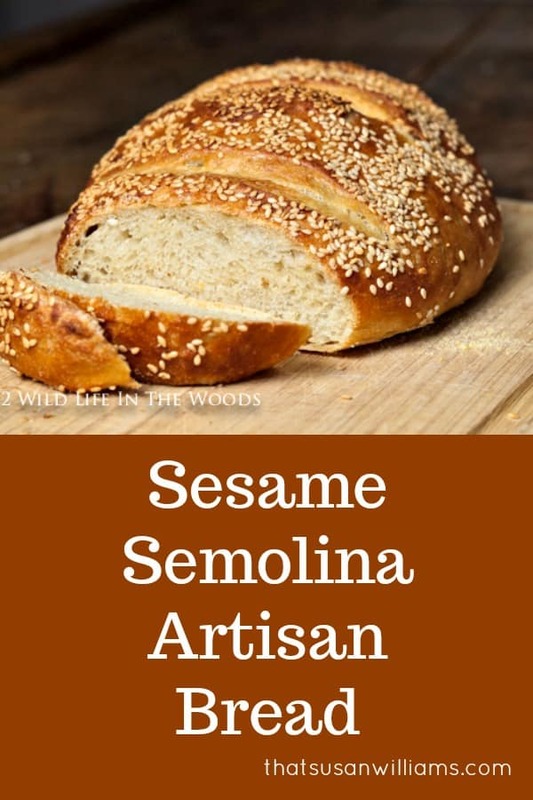 Sesame Semolina Artisan Bread is definitely the favorite bread of my childhood, and is possibly still my favorite loaf of bread. Ready to try this? Pin it! Share it! You know you should! The recipe I’m going to share with you today is an adaptation I came up with that sprang from two catalysts: first, a favorite childhood memory. And second, my love for whole grains.I’ve been making Artisan Bread off and on for a few years, first using Jeff Hertzberg and Zoë Françoise’s Making Bread in Five Minutes a Day method, and then using Cooks Illustrated’s recipe, and then using Mark Bittman’s recipe, all of which I’ve liked, for various reasons. First, the memory: I grew up in Charleston, West Virginia, which, in the 1960’s, probably wasn’t the most cosmopolitan town. But my Mom was smart enough to know a great loaf of bread when she found one, and there used to be a nice restaurant in town called The Sterling, that sold their delicious Grecian bread “to go”. They also made a really good salad dressing, that my mother figured out how to make at home. Almost every summer Saturday night at our house was “Steak Night”. Steak Night was awesome: Dad grilled steaks in back of the house that came back in still smelling of a hint of lighter fluid, juicy and pink on the inside, and over which we ladled warm, melted garlic butter. These we served with an iceberg lettuce salad with crisp, cool, chopped cucumber and slices of lusciously summer ripe red tomatoes, all drizzled with that special restaurant tangy salad dressing, and fresh, crusty, sesame seed coated Grecian bread, to which I applied lovely, cool pats of creamy butter. Semolina flour comes from processed durum wheat. It’s the flour from which the world’s best pasta is made. It is yellow in color and higher in gluten, thus producing a heavier, more dense flour. The first time I tried to duplicate this recipe, I bought some Bob’s Red Mill Semolina flour, which comes in little 24 oz. plastic bags, that you can find in the “organic” section of most grocery stores. It worked well, and if you don’t have a grain mill with which to grind your own flour, Bob’s Red Mill will give you excellent results. However, now we come to the second part om my inspiration for my adaptation of the recipe, which involves my love for whole grains. This past May I attended a homeschool curriculum fair, and I saw The Breadbecker’s had a booth, there. 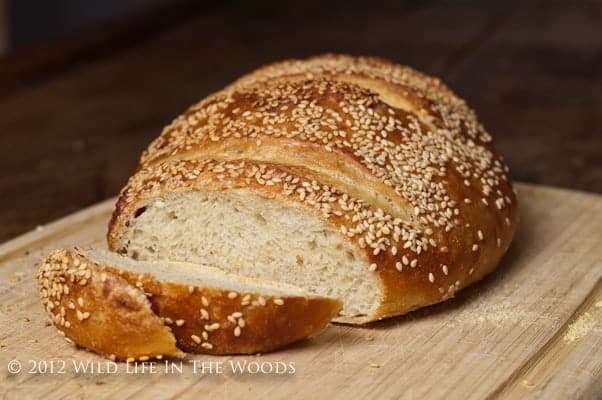 (They have everything you would EVER need to make homemade bread, and, in particular, if you are interested in making bread made with whole grains.) I have purchased wheat berries from them before. So, I cruised quickly through their booth, to see if they had anything that might pique my interest. And lo, and behold, they were selling Durum Wheat Berries, which I knew to be the whole grain “granddaddy” of semolina flour. If Jesus is the Bread of Life, this might just help me love Him even more. I could, and I did, and you can, too. And remember: if you don’t have a grain mill, just let Bob’s Red Mill do the grinding for you, and try this bread recipe anyway. It is SO yummy! I’ve made 3 batches since, and it is now my go-to bread recipe. Important Recipe Note for those using Bob’s Red Mill Semolina Flour, rather than whole grain durum flour: If you use Bob’s Red Mill Semolina flour, I recommend you use 3 c. semolina flour, and decrease the all purpose flour measurement that I give in the recipe to 3 1/4 c., making the total amount of flour in either version of the recipe equal to 6 1/4 c. flour. So, no matter which ratio of flours you use (3 to 3 1/4 or 2 to 4 1/4) you should come out using a total of 6 1/4 c. of flour. 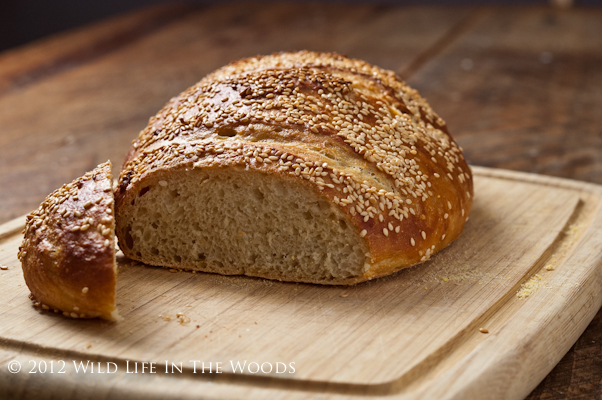 Since the Semolina flour is lighter than the whole grain durum flour, you can use more of it in the ratio. Make sense? This recipe makes four 1 lb. loaves, or two 2 lb. loaves. I find a one pound loaf at my house barely makes it to being cool before it is completely devoured, so while you can make a smaller 1 pound loaf, you might want to try the 2 lb. size, if you live with ravenous wolves, like I do. Oh, goodness, me. Pass the butter. Mix the yeast and salt with the lukewarm water in a large 5qt container. I use a large plastic tub with a lid, but I do NOT seal the lid to make it airtight. Cover (not airtight...this needs to off gas a bit...but then...don't all God's creatures need to do that? Yeast is no exception.). Allow to rest at room temperature until the dough rises and collapses (or flattens on top) approximately 2 hours. The dough can be used at this point, or you can store it in your fridge for up to 14 days. As if you could wait that long!!! Preheat the oven to 450º, with a baking stone placed on the middle rack, and the bottom of a broiler pan on the shelf just below that. Time to use that mysterious cornstarch that’s in the ingredient list. You’re going to make a Cornstarch Wash to make the bread shiny, and help the sesame seeds to stick to the outside of the bread. Blend the 1/2 t. of cornstarch with a bit of water to form a paste. Add 1/2 c. of water, and whisk with a fork. Microwave for 60 seconds, till mixture appears glassy. You can store the unused portion in the fridge, covered with plastic, for the next loaf. 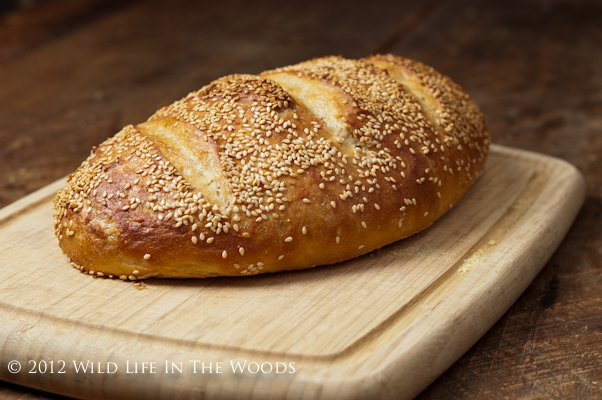 Just before baking, paint the surface of the loaf with the cornstarch wash, sprinkle with sesame seeds, and slash the surface of the bread (I usually make 3 diagonal slash marks) about 1/2″ deep, using a serrated knife. Gently place the loaf and the parchment paper onto the hot baking stone, using the parchment paper as a sling to carry the loaf to the baking stone. Pour 1 c. of hot tap water onto the broiler tray below it, and quickly close the oven door. Bake for around 30 minutes, until deeply browned and firm. Adjust baking time to the size of your loaf, and your own oven’s performance. Allow to cool before slicing and eating. Important Recipe Note for those using Bob's Red Mill Semolina Flour, rather than whole grain durum flour: If you use Bob's Red Mill Semolina flour, I recommend you use 3 c. semolina flour, and decrease the all purpose flour measurement that I give in the recipe to 3 1/4 c., making the total amount of flour in either version of the recipe equal to 6 1/4 c. flour. So, no matter which ratio of flours you use (3 to 3 1/4 or 2 to 4 1/4) you should come out using a total of 6 1/4 c. of flour. Since the Semolina flour is lighter than the whole grain durum flour, you can use more of it in the ratio. Allow it to cool before cutting. Repeat after me: ALLOW IT TO COOL. Hang it. Give me the bread knife, NOW, or someone’s getting hurt.